Libelium and Intel engineers have cooperated to integrate Arduino and Raspberry Pi shields and modules to the Intel Galileo development board. As a result, a new API for our Open Source eHealth Sensor Board and a suite of step-by-step tutorials have been released to help developers design new Internet of Things applications with software and hardware. 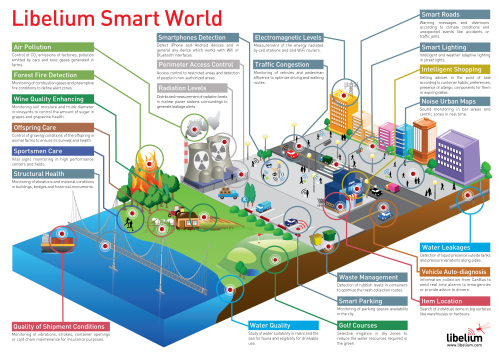 Libelium, provider of wireless sensor network technology used in Smart Cities and Internet of Things projects, is one of five “Cool Vendors” profiled by Gartner Inc., in its 2014 Embedded Software and Systems report. With this new sensor we can detect the presence of water or other conductive liquids in a continuous line with no blind spots. Thanks to the cord / string shape of the sensor we can ensure that any drop of water will be detected as soon as it enters in contact with the sensor. The new water leakages sensor is specially designed for its installation close to pipes and other water transportation tubes in in roofs, kitchens, basements, machine rooms, laundries, etc. Read more. Libelium today announced the availability of a new Smart Lighting solution for Smart Cities deployments based on the modular Waspmote Plug & Sense! wireless sensor network platform. Measuring ambient light (luminosity) with a new set of directionable sensor probes, Libelium’s Smart Lighting device also includes temperature and humidity sensors and is capable of monitoring conditions inside buildings or in tunnels, and outside, in the streets. Read more.